Mom and Dad got married on December 27, 1947. The ceremony was held at Sparky and Francis' house in Glendale. You might be able to recognize some of the people in the background. I can see why Dad went ga-ga for Mom. She was a FOX! I can't believe I just said that about my mom. Please click on the comment button and share your thoughts with the rest of the family. Thanks to Greg for the link to Gary's high school year book photo. I am enjoying these photos you have scanned of Ruby and John. 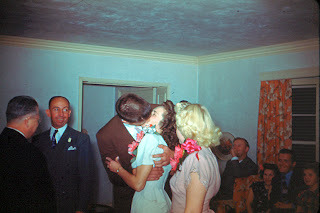 There's a very interesting photo, where my Grandparents and my Aunt Carol, are seated on the couch in the backround. It's strange seeing the three of them together from so long ago, given that they have all passed away. I showed these pictures to mom and dad to get an idea of who some of the people are that I couldn't identify. There are a lot of great memories in these pictures. I want to thank cousin Greg Tober for the link to the Arcadia High School yearbook. My kids got a real kick out of it. Thanks Greg. What a pal. By the way, Steve is 1971. Sandy is 1967? and who knows when Don graduated. They all went to Arcadia. So did Greg and Mark. Check out the Tober family website. Greg did a great job. Don graduated in 1962, his photo is on ArcadiaApaches.com. Sandy was the class of 66, my wife attended their 40 year reunion on behalf of her brother Darryl, who passed away. Stevie Nicks the singer from Fleetwood Mac was at the reunion, the photos are posted on the Arcadia Website. I wonder if Sandy knew Stevie? Copy and paste the link below into your browser if your a Stevie Nicks fan.